I have bought an online study course but I am told I need Puffin web browser to view the course. It appears I can install Puffin browser on my Android phone (Vodafone Smart Prime 7), but if I decide after completing the course to go back to normal Google Chrome browser, would Puffin easily uninstall? Will it cause any problem? I'm afraid I'm not a big user of modern technology and do not want to bugger up my phone browser! does not make any attempt to block uninstallation at all by any means. I'm unsure whether Puffin prompts its users for drive-by installation but even that would not harm cause if unknown sources are disabled. You can definitely, easily and like other apps, remove this app from your phone either through Settings app or from Play Store app itself. Alternatively, you can choose to keep it by following the other answer here. 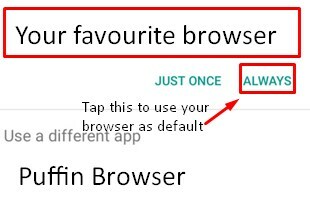 Actually no.... it's simply just another application, Android allows you to choose your default browser of choice, Puffin won't bug you up at all you can just launch it from home screen when you need it and it can be used as an alternative browser. Something like this should pop up. So in short, Puffin Browser will not bug you up a bit and you are good to go. Not the answer you're looking for? Browse other questions tagged uninstallation puffin-web-browser or ask your own question. Who can see how many people have uninstalled an app? How do I uninstall Cool Browser? Can Gmail be uninstalled on Android 5.1.1 (Lollipop)?